1. Following the 1979 Islamic Revolution, Iran has been the only country in the Middle East standing against the US and pursuing independence. What’s your view on such Iranian paradigm of countering the US hegemony? Has the Islamic Republic of Iran succeeded in promoting that model and enlightening the international community about Washington’s policy of interference? The 1979 Islamic Revolution succeeded in freeing Iran from the US empire. Its success has been largely due to the genius of Imam Khomeini, who found a way to bring Islam back into the center of public life, in the context of a modern constitutional republic, through the Wilayat al-Faqih model. Though Iran has unfortunately not succeeded in spreading the Wilayat al-Faqih model to other Muslim countries — presumably because those countries do not have scholars with the necessary courage and abilities to implement it, and also because the larger community of Muslim scholars has been unable to decisively transcend sectarianism — it has succeeded in forging an Axis of Resistance against the US-Zionist forces that dominate the region. 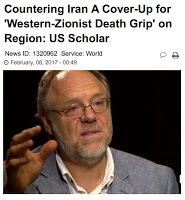 To a lesser extent Iran has also succeeded in helping mobilize a diverse coalition of international intellectuals and activists who reject imperialism and Zionism. Many of these thinkers and activists, hopefully including myself, will be present at the 6th International Conference in Support of the Palestinian Intifada to be held February 21 and 22 in Tehran. 2. What approaches do you think the hegemons have adopted to hinder the spread of that Iranian anti-arrogance paradigm in the Middle East? The hegemons fought back against Iran’s Islamic Revolution first by trying to stop it, then by attacking it using terrorism and the Imposed War with Iraq, and finally by using a “containment” strategy. This strategy, like the one developed by George Kennan for the containment of the USSR, attempted to stop the “expansion” of Iran’s influence using “the adroit and vigilant application of counterforce at a series of constantly shifting geographical and political points” (from Kennan’s famous “Mr. X” article). The US and Israel have supported the M.E.K. and other terrorist groups; supported other anti-Iran forces in the region; interfered in the internal politics of Middle Eastern countries to turn them against Iran; imposed blockades and sanctions against Iran; propagandized against Iran and its Islamic Revolution in both Western and controlled Middle Eastern media; and, especially after Hezbollah’s 2006 victory over Israel, incited sectarianism and Iranophobia among Middle Eastern Sunni Muslims. They have tried to steer the conversation away from the real issue: Should Middle Eastern countries be Islamic and independent, or should they be pawns of imperialists and Zionists who are not just non-Muslim, and not just actively hostile to Islam, but who are actually waging a long term war against Islam and Muslims? 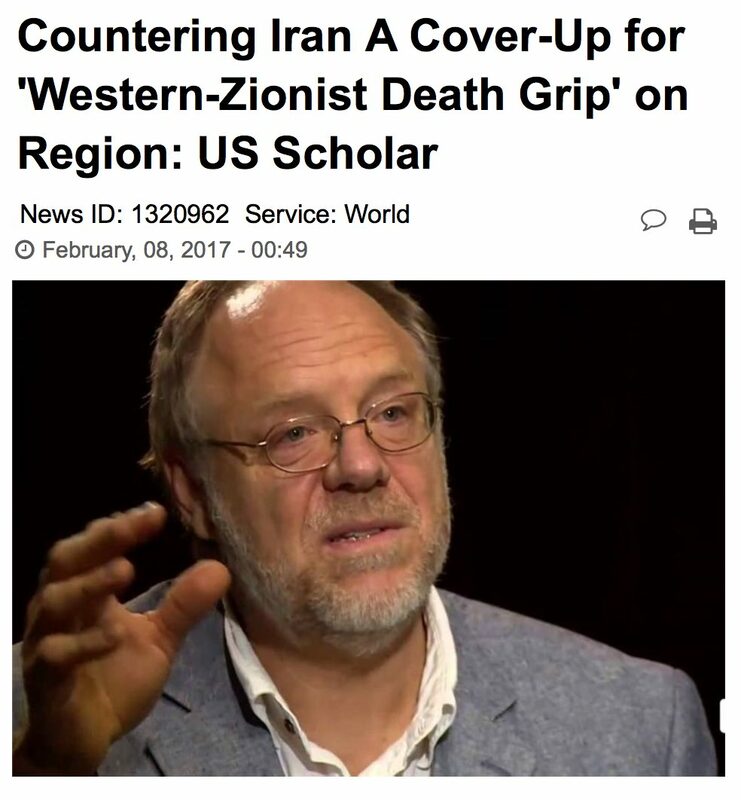 The Western and Zionist propagandists attempting to “contain” Iran and its revolution try to hide this, the real issue, and instead dupe Middle Eastern people into seeing the struggle in the Middle East as Shia vs. Sunni or Persian vs. Arab, all the while ignoring the Western-Zionist death grip on the region. 3. What could have happened without the revolution in Iran and in the absence of the Iranian ideology of countering arrogance? How do you think the regional and international situation would be shaped in that case? It is hard to imagine a 2017 Middle East in which the Pahlavi dynasty still ruled Iran on behalf of Zionism and US imperialism. It is likely that such an Iran would be a bit like today’s India. It would have higher rates of poverty and illiteracy, but there might also be an economic boom for the rich and those collaborating with the imperialists. It might also be afflicted by environmental disasters, as happens wherever Western corporations are allowed to set up shop. The Palestinians would be even worse off than they are in today’s actual world. The forces of resistance against imperialism and Zionism would not have a friendly government devoted to helping them. Israel might occupy all or most of Lebanon, and the Palestinians might have been completely expelled from historic Palestine. Finally, and worst of all from my perspective, there would be no workable contemporary model of Islamic governance that Muslims around the world could look to and learn from. For even though Iran’s Islamic Republic has not directly inspired the creation of other independent Islamic Republics, it has shown that such a model can work, even when all of the world’s most powerful empires oppose its existence. Thanks to Islamic Iran’s example, Muslim scholars and activists in other countries may one day rise to the level of their Iranian counterparts and help their own countries become genuinely independent and Islamic.